EVERY time someone dies on Gladstone's roads, chances are it's Colleen Smith who has to pack her camera bag, don her latex gloves, kit up and head to the grim scene. The smell of death and trauma fill the air, as she gets to a job, taking photos capturing someone's last moments and their final resting place, trying to process the scene as quickly as possible, in order to get the deceased back to their family. Often times Senior Constable Smith feels a sense of frustration at the needless loss of yet another life through accidents so easily avoided. "It is extremely confronting and frustrating when we get called to an accident, especially if it involves children," Snr Const Smith said. "It doesn't matter just being children, the deceased or any fatality is disturbing to us... but I guess at the end of the day we've got a job to do." 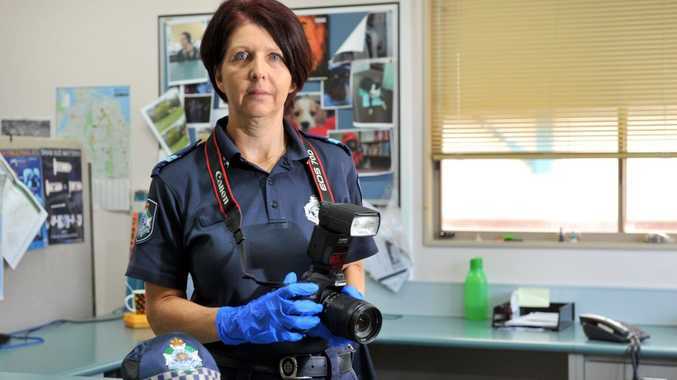 A Scenes of Crime officer at Gladstone station for the past 2½ years, Snr Const Smith wished people would simply slow down on the region's roads, sick of seeing unnecessary loss of life. "I would probably say 90% of crashes could be avoided and that's the thing I think about when we go to a scene; why don't people just slow down or why do people need to use mobile phones?" she said. "Plan your trip ahead. Why is there always such a rush to go anywhere?" One horrific crash sticks in Colleen's mind more than others, the Bruce Hwy smash south of Miriam Vale on November 23, 2012, which killed a young French tourist and seriously injured two of her friends. The chaotic scene, and the fact it could have so easily not happened, is what sits with Snr Const Smith. "There was one fatality where a young French girl, her life was taken just south of Miriam Vale and again that was just so avoidable you know," she said. "Her car was hit from behind while she was stationary at roadworks, so that one really stands out for me." The friendly Scenes of Crime officer had a simple message to deliver to motorists on Fatality Free Friday. "Plan the trip, slow down, there's no hurry to get anywhere. Just enjoy the trip," she said. "People need to slow down and think about their trip and think about who else is on the road you know; there's also families and elderly travelling."